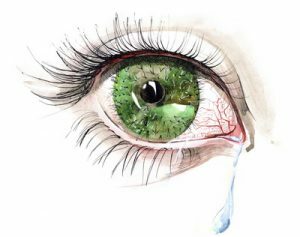 Dry eyes can occur naturally as a result of aging or hormonal changes (which can also result in your eyelashes becoming very thin), typically in women who are pregnant, taking oral contraceptives or going through menopause. In fact, women over 50 have a 50% greater risk of dry eye disease than men do of the same age. It can also result from taking certain medications that reduce tear production such as antihistamines, blood pressure medications and antidepressants. Environmental factors can also play a role in drying out the eyes and DED is common in areas where the climate is dry, dusty and windy. Home air conditioners or heating systems and excessive time spent staring at a computer or television screen can also dry out eyes and exacerbate symptoms due to the lack of blinking while staring at our screens. Dry eye disease won’t have a permanent effect on your vision, but there is no reason to endure dry, itchy and uncomfortable eyes, especially since there are so many treatment options to increase moisture and comfort. It’s also important to realize that this is a chronic disease that needs consistent treatment. Your Davie eye doctor will work with you to create a long term strategy to keep your eyes as comfortable as possible.